Magica started in February 2002 as the solo project of Bogdan 'Bat' Costea, guitarist (at that time) of Interitus Dei. The reason for starting this band was Bat's desire to play the music that he likes: heavy metal & melodic rock. The first line-up consisted of: Ana Mladinovici - vocals (also a member of Interitus Dei at that time ), Bogdan 'Bat' Costea - guitar and Valentin 'IngerAlb' Zechiu - bass guitar (ex-Web, and also the man behind the projects Inger de Fier & Telurica). The recordings for the 1st album started in spring 2002. After 2 months of intense work, the material was ready! 12 power melodic heavy metal songs, in the vein of Rhapsody, Nightwish, and Helloween, which show the high potential of the band. The album, entitled "The Scroll Of Stone", tells the story of princess Alma - tricked by a demon, she loses her soul, and so her quest begins... she has to find the scroll of stone, the only thing powerful enough to break the demon's spell. "The Scroll of Stone" was produced in Romania by Sigma Records and was well received by the media, in spite of the lack of promotion. Songs from this album were aired on Radio Romania Tineret, Radio Dada, Radio Cluj, Radio Sky, Activ FM, etc. Several reviews were written by magazines such as: HMM.RO, or Heavy Metal Megazine, and an interview with the band was published in the No. 10 (70)/August 2002 issue of the prestigious Heavy Metal Magazine, and some live interviews on Radio Sky. A new member joins Magica in summer 2002: Adrian Mihai - drums, followed by Viorel Raileanu in autumn, who took over the keyboards. After a few months of practice, Viorel decides to leave the band, because his job took all his time. Soon after Magica parts with Adrian Mihai, who moved to Bucharest, replaced in spring 2003 by Cristi Barla. 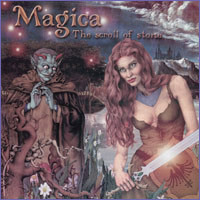 In spite of the fact that Magica has never performed live until 2003, it was designated by the readers of Heavy Metal Magazine as the "Best Newcomer" of 2002; "The Scroll of Stone" has entered the "Best Romanian Album 2002" Top 10 of Bestial Metal! magazine at number 7. Also, one of our songs ("Mountains of Ice") was included on Maximum Rock #1 cd included with the 1st issue of Maximum Rock Magazine. 6fingers became Magica's keyboard player in summer 2003. September 2003 brings a license contract with Divenia Music from Mexico and a new cover from Luis Royo, the famous fantasy artist. Magica began playing live at various shows in Romania and one show in Bulgaria, spreading the metal word. 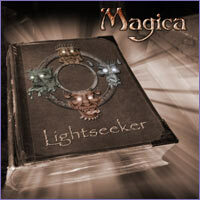 Currently the second album, "Lightseeker", is ready and has been launched in October 2004 in France through Underclass Music and in America through Divenia Records. Our first video, "Bittersweet Nightshade", was ready on February 10, 2005. Magica has been featured in the famous "Metallian" and "Rock Hard Magazine". In 2006 the band had the pleasure of touring Europe opening for AFTER FOREVER and NIGHTMARE.